There is joke in London that the British Airways (they were one of the initial owners of London Eye before Merlin Entertainment bought it) was earning so much from the London eye that they planned to give up their Airline Business!There might be some truth in this statement as London eye is one of the biggest tourist attractions in London. Also, The setting for it is perfect. 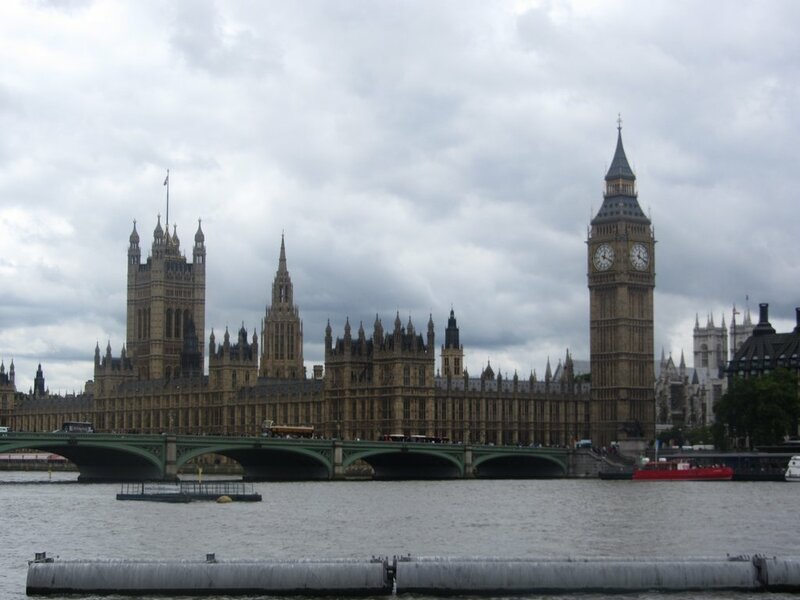 It’s on the south bank of the river Thames and just across the river you can see the iconic Big Ben and the Houses of parliament. Needless to say, London eye was the first place I decided to visit in London. 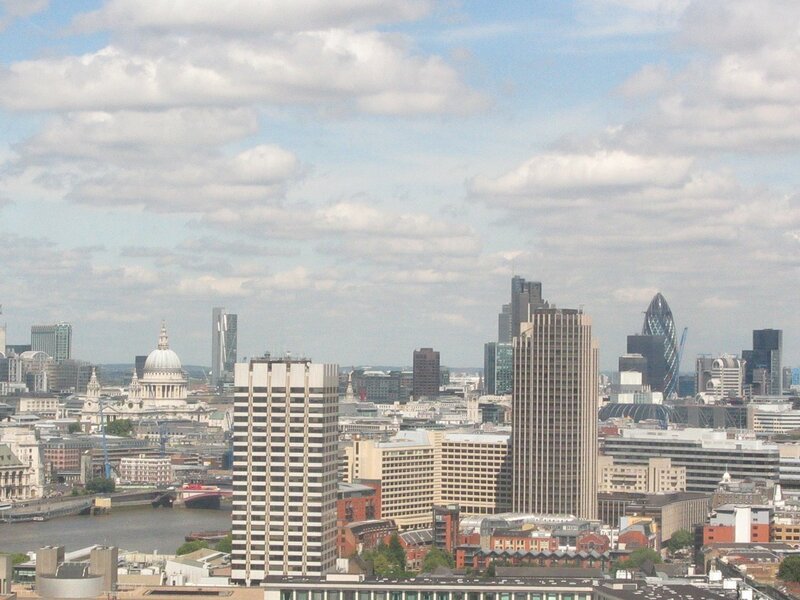 But I had not accounted for the capricious London weather. The day dawned extremely dull and grey. It was raining and even the roses in my aunt’s garden seemed to be shivering under the cold wind. I dropped the idea of spending a day outdoors and I decided to take myself to the British Museum where I could potter about and look at the exhibits in comparative warmth and comfort. My aunt however had other plans. The weather bureau she said, had promised a warm and sunny afternoon in spite of a wet morning. And since sunny afternoons are as rare as unicorns in London it must not be wasted by staying indoors. As the saying goes, we must make hay while the sun shines! I for the life of me couldn’t imagine how this miserable rainy day would turn sunny in a few hours but my aunt" faith in the weather Bureau was unshakable. Sunny they had said so sunny it would be! So I reluctantly agreed to go to the London Eye with her. By the time we were walking towards the tube station (as the underground in London is called) the rain had stopped and the sun was feebly trying to peep out from behind the clouds. I became a little hopeful. The weather Bureau might be right after all. But my hopes were dashed as soon as we reached our destination and emerged from the bowls of the station. 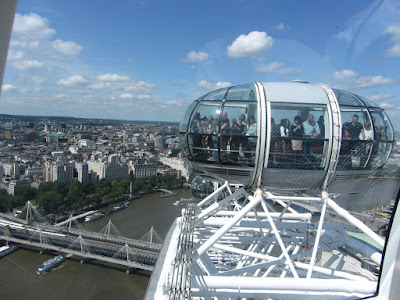 It was raining again and the sky had turned a morose grey.Buttoning up our jackets and cursing as we tried to control our umbrellas in the chilly wind we made our shivering way to the London eye.London eye was a magnificent sight even on a dull day. This giant Ferris wheel, standing at 135 m, is quite an excellent piece of architecture and design. I had no intention in to join the serpentine queue of people buying tickets to get in it. 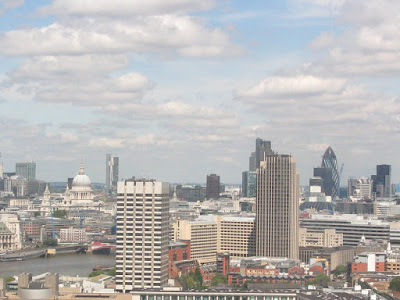 After all, there is no point going up to see a panoramic view of London when the whole damn panoramic view would be hidden from you by mist and clouds is it! My aunt was still adamant that the sun would come out if only I would have the patience to wait. 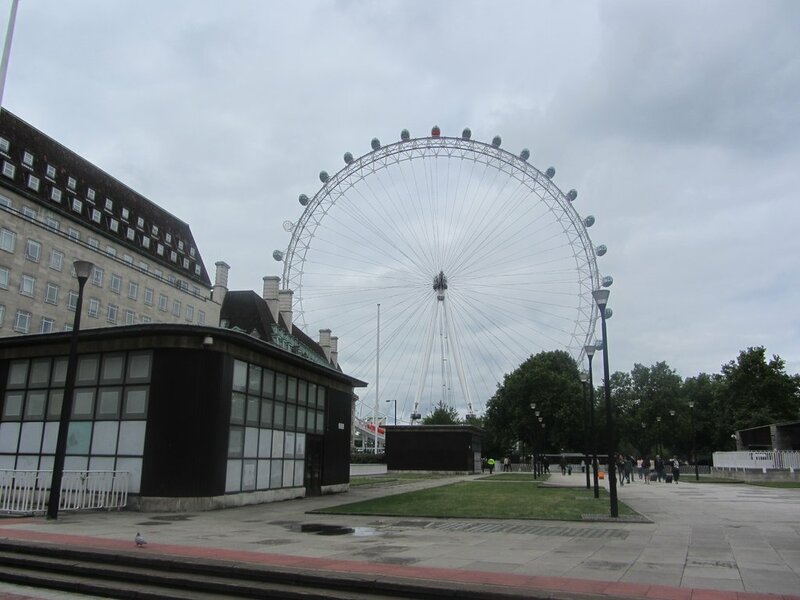 So to put my time to good use I decided to explore the area around the London eye. 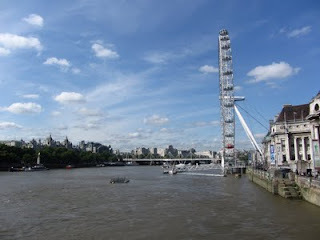 This area,known as the South Bank starts at the Westminster Bridge, where the London eye is situated;and goes up till the Waterloo Bridge.Westminster Bridge is rather quaint and probably the most photographed bridge on London. 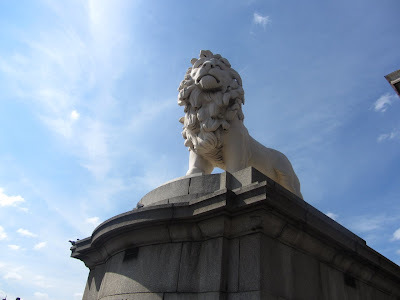 It has the South Bank Lion at one end and the Houses of Parliament, Big Ben at the other end. I took a few rather dull looking photographs ! As you can see from the first snap, the Westminister Bridge is painted a rather garish green. (apparently because the seats in the House of Commons which is just across the bridge are also painted green). Most of the tourists usually walk across it to reach the House of Parliament etc.I decided to keep my walk across the bridge for a sunnier day and wandered about the South Bank instead. 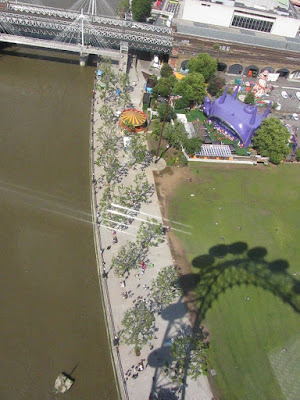 South Bank is a very artsy and eclectic part of London. As you walk along the river from the London eye, you cross many theaters and cultural venues such as the London Film Museum, The royal festival hall, Hayward art gallery etc. This area has some fantastic restaurants and bistros where you can take you food outside and enjoy the view and the river. Inspite of the cold wind I rather enjoyed my walk along the river. Infact as I would discover later, walking along the Thames is actually the best way to see London. I passed my time pottering about, clicking snaps, watching the tourists and at the same time keeping an eye on the weather. The weather gods were definitely out to test my patience. They really couldn’t make up their mind. 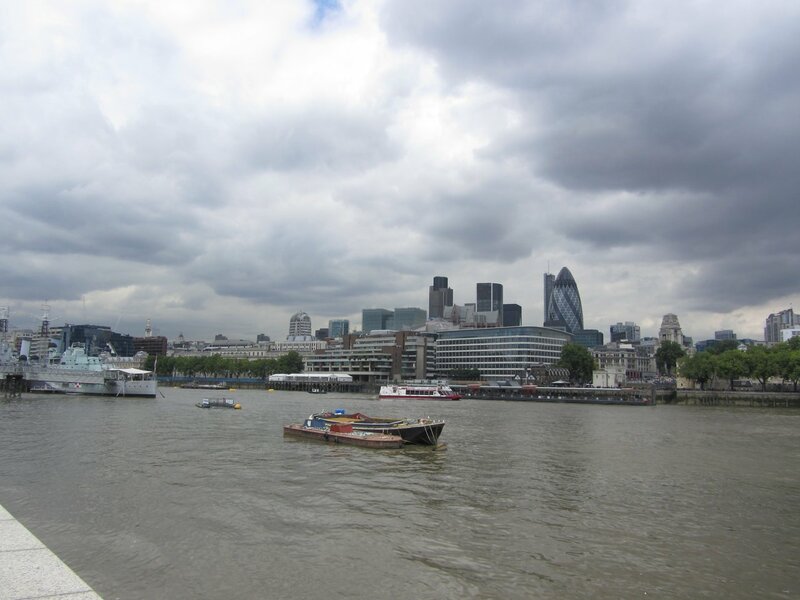 It would stop raining, the sun would start shining but as soon as we started to make our hopeful way towards the London eye, it would become cloudy and dull again ! It was exasperating to the extreme ! But around 1 o clock,as if by magic the sky started to clear and within half an hour we had a blue, almost cloudless sky. 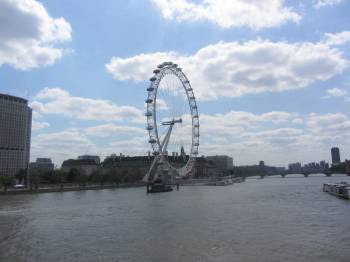 I took a pic of the London Eye from the Westminster bridge. Compare this snap to the above pictures that were taken just an hour back ! It made me wonder if there was some harry potter like magic going on in the weather bureau ! Off course we made a beeline to buy our tickets for the London Eye. By the time we were standing in the line to board the London eye our jackets were off and I was sweating even with just a T shirt on. 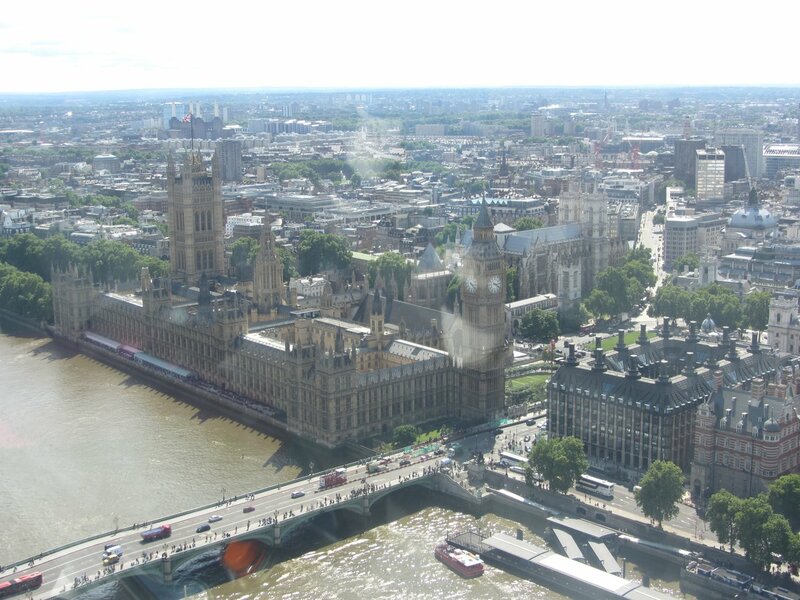 Needless to say the view from the top of the eye was simply spectacular. It was warm sunny and totally cloudless. The sky was a bright dazzling blue ! ﻿﻿﻿﻿﻿﻿﻿coming up next - Trafalgar Square - Where have all the pigeons gone ! And yea, how the weather can test our patience! London eye! I had a go at the one in Dubai. This looks awesome. 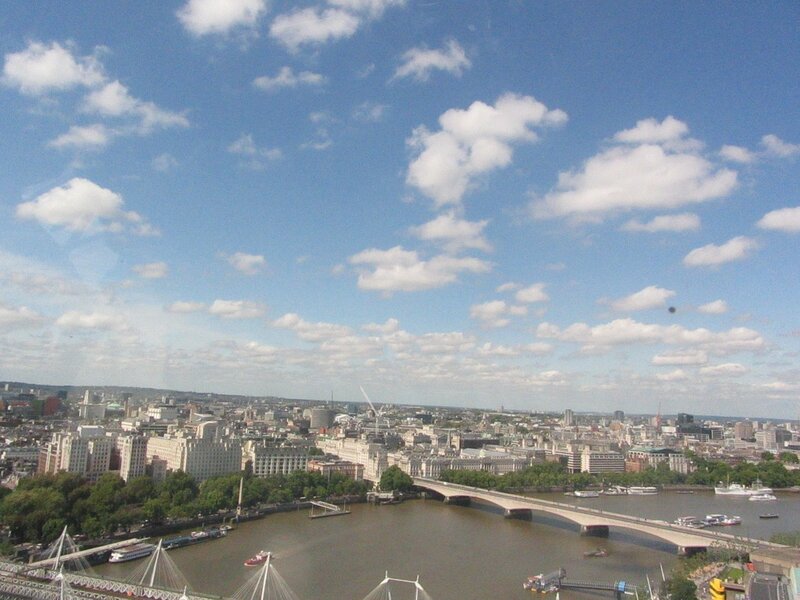 The weather seems to have been teasing you a while before letting you on the the London Eye. Hehe..
Lovely pictures. I am curious, so which camera did you settle for finally? Perhaps I will see all this next year, hopefully! :) I love reading your travelogues. They are very well and interestingly written. Btw did you send in your blogs for the competition? It is beautiful .. although expensive i must say.. I did try to ask for police discount didnot give me any :( he heh e.. But its is beautiful you can see as far as the wembley and all ..
＠Scorpria- Thanks ! yeah the weather was out there to get me ! But all is well that ends well ! @Shail – Thank you ! you are simply too kind ! Yes I did send my blog for the competition ! I finally bought Canon sx 230. I hope you get to see all this next year ! @Bikram – well yeah rather expensive I must say ! but worth it !